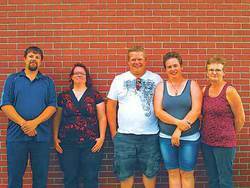 Aug. 16, 2013 3:00 p.m.
Millet, AB – The big winner of the Millet Red Eye is The Friends of The Millet Library and the children’s programs it helps fund. The Millet Red Eye held a silent auction that raised $1,300.00 for The Friends of The Millet Library. Jason Jaffray organizer of the Red Eye was looking for a way for the tournament to make a contribution to the community; his neighbor Debbie Swanson was looking for a fundraiser for The Friends of the Millet Library and the idea for the silent auction was born. The group would like to thank Arbors Greenhouse, Apple Drugs, Daisy Lane, Scissors, Millet Liquor Store and More, The Town of Millet, Jessica Wolden – Scentsy, Denise Blackstock – Activate, Brooke DeMartinis – Timeless Touch Massage, Christie Parkinson – Curves on Whyte Ave., Cash Canada Pawn and Ken Roberts Sports Memorabilia for their donations to the silent auction.